Two brothers who survived the 2002 Gulberg massacre -- Imtiyaz Pathan and Firoz Khan Pathan -- have entered into politics and filed their nominations from Kheda and Gandhinagar Lok Sabha constituencies respectively. Imityaz, 42, is a candidate of the Apna Desh Party and has been allotted the election symbol of pressure cooker, while Firoz, 45, is contesting as an independent candidate against Bharatiya Janata Party chief Amit Shah. 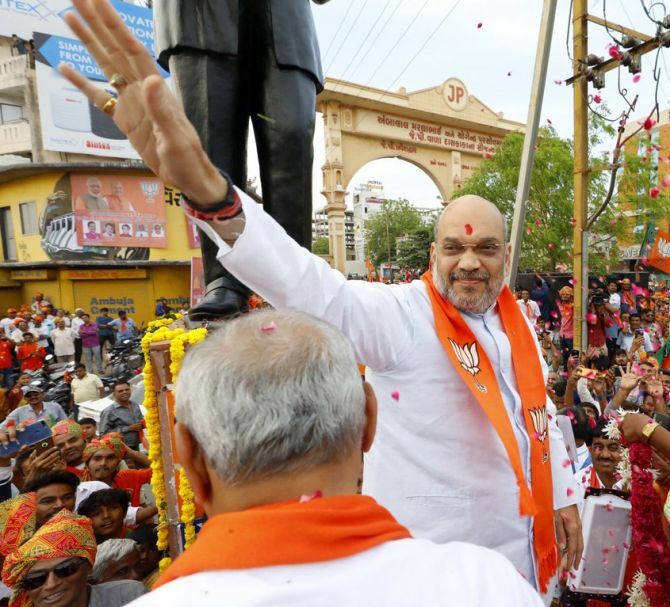 Shah, who is a Rajya Sabha MP, is contesting the Lok Sabha elections for the first time. He has been fielded from Gandhinagar constituency, which was represented by BJP veteran LK Advani. Firoz now lives in Vejalpur, which falls under the Gandhinagar Lok Sabha constituency while his younger brother Imtiyaz resides in the city area of Gomtipur. When a mob attacked Gulberg society in Ahmedabad following the 2002 Godhra riots, the Pathan brothers lost as many as 10 members of their family, including their mother. Firoz had filed a case against social activist Teesta Setalvad and her husband Javed Anand alleging misuse of funds collected for the victims of the riot. "Since 2002, we have not received any justice and we are still fighting for it. We were supported by an NGO but they also misused funding collected in our name and justice was again denied to us. This why I have decided to contest elections from MP seat. If 2.5 lakh Dalit and 3 lakh Muslim voters cast their vote in our favour then there are chances that Congress and BJP will be defeated," Firoz said. He added that his Hindu friends have extended support to him and he is confident of getting votes them. Highlighting the need for a strong leader who can raise the voice of Gulberg riot victims in the Parliament, Firoz said, "I want to establish peace and communal harmony. Nobody is raising our issue in Lok Sabha. There is no Muslim MP who can speak for us. In Rajya Sabha, there is Congress leader Ahmed Patel but I have no hopes from him." "The situation would have been different with Jafri Saab (former Congress MP Ehsan Jafri who was killed in the massacre). He was the only person who worked for us. So, this is the reason I want to get elected as an MP. I will surely go to the Parliament to seek justice for my brothers," he added. Around 68 people were killed at Gulberg Society on February 28, 2002. The incident took place a day after the S-6 Coach of the Sabarmati Express was burnt at Godhra, inciting riots in Gujarat. Polling in all 26 Lok Sabha seats in the state will be held on April 23. Is Amit Shah anxious about 2019?